By bluechip on January 15, 2018. Posted in Market Trends. According to Urbanize:: A collection of small retail buildings near the intersection of National Boulevard and Barrington Avenue have bit the dust, as plans for a controversial mixed-use development move forward. 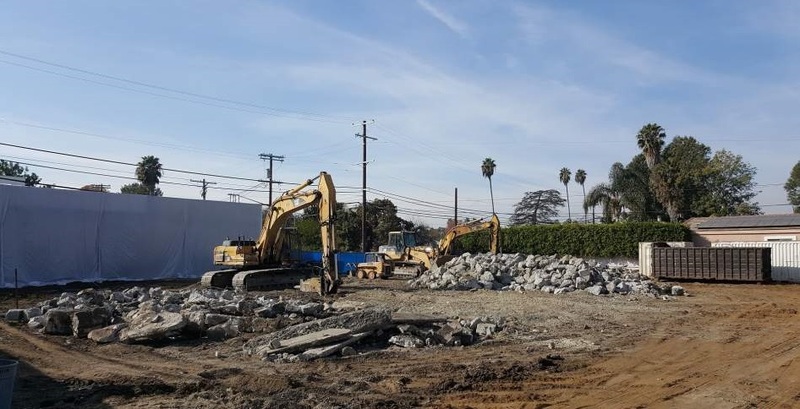 The four-story building, now underway at 11671-11677 W. National Boulevard in Mar Vista, will include 48 residential units atop ground-floor office and retail space, in addition to two levels of basement parking. Frymer Construction is serving as the project’s contractor. Earlier this year, the Mar Vista Community Council announced its opposition to the development on the basis of a lack of community outreach from its developer.